Dream In Darkness: Christmas Tagging - Naughty, or Nice? and Sue Tells All! Christmas Tagging - Naughty, or Nice? and Sue Tells All! We would like to thank each of you for playing with us this 8 months and for the support you have given us! And we want to wish you all a wonderful Christmas and New Year's! 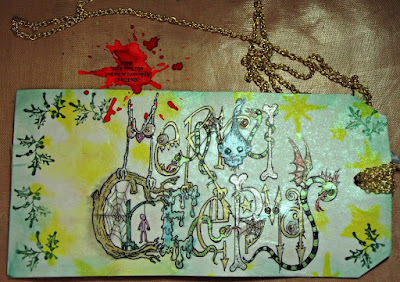 What better way to end Creepmas than with CT Anne's holiday tag? None, so here it is! Are we talking Cemetary Graffitti here? Well! We all know Santa is a jolly know-it-all, that implies wisdom. 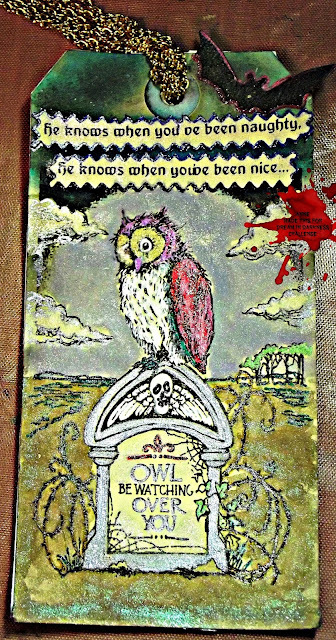 Owls are "known" for wisdom, so does that make Santa an Owl? 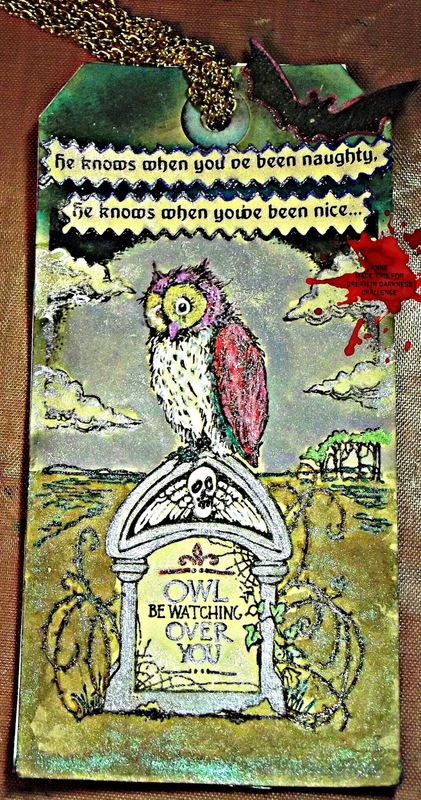 Stampendous provided the Tombstone Owl image,then glitter pens and Lindys Stamp Gang sprays were washed on. The printer got a workout with the "sentiment", and the bat (it wouldn't be Creepmas without a bat!) is a QuikKutz die. We can't wait to see how Sue's tale of Kevin ends so here we go! It was the day before Creepmas Eve. All was fairly peaceful.. No unwanted visitors, no Creepmas movies. The Demon couch was out on the front porch just in case Nan tried to plump up the cushions.. Leigh had a go and got a nasty nip. Kevin was helping Fifi clear up the kitchen when he heard the strangest sounds. A loud scuffle and banging and shout-singing. Deborah opened the front door and... carol singers! They were trying to drag the couch off the porch or at least to pull some boots out from under a cushion. It turns out that Polly had wanted a rest and had sat down when really she should have been singing with gusto. The couch had still been feeling a bit peckish and had nibbled her bum. She had obviously tasted quite nice because the next thing she knew was that she had become tangled in the springs and bones. Dan thought he should at least make a bit of money through the loss of one of his singers and started rattling his tin but all he ended up getting was a full card of forged Morrison's stamps (Without an M) (These really are getting forged...we know 'cos ours were checked yesterday) By the time the rest of the ladies gathered at the bottom of the stairs Dan and his group had elbowed their way into the hall and refused to leave. 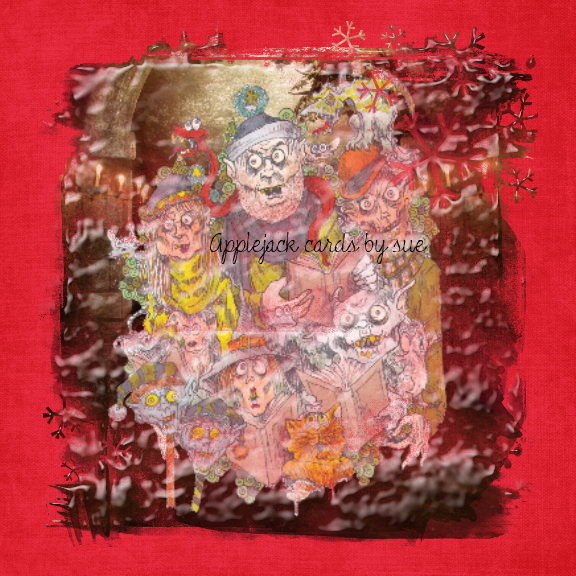 Thanks to our Creative Guest Sue for a brilliant story to get us this far to through Creepmas! We hope you all remember this month's challenge runs until the very last day of the month and year! even though we will be partying at the house and might not notice you dropping your entries off! And don't forget to come see us on January 1st...we have heard whispers in the fog of some awesomeness to come! Happy Holidays from the Dream in Darkness Creative Team to you and yours!! Can I have that portal spell for MY Creepmas family gathering please? Enjoyed the December posts very much! Merry creepmas!